Paul Cézanne, Le bassin du Jas de Bouffan (1876) R278, oil on canvas, 49 x 55 cm, Dr. Otto Krebs, Weimar, Germany, presently at The State Hermitage Museum, St. Petersburg. WikiArt. In my previous article in this series, I drew attention to three paintings by Cézanne in which he depicted reflections on water which were markedly out of kilter with those that would have been expected by optical principles. I also finished by mentioning briefly that many other of his paintings had similar issues. I worked through the 954 oil paintings accepted by Rewald as being authentic, in his catalogue raisonné of 1996. Of those, 57 included sufficient water surface as to merit further examination, and I was able to locate suitable electronic images of 49, that is 5% of his total surviving works in oils. If anyone tries to tell you that Cézanne did not paint many landscapes featuring reflections on water, or was not interested in such reflections, I think that is good evidence against that claim. I have been less able to be so systematic when looking at his watercolours, as the catalogue raisonné for those is older (1983) and most are inaccessible, being in private collections. However I have included 6 significant watercolour landscapes containing reflections, which I have been able to examine in electronic form. These paintings span Cézanne’s entire career, from 1860 to 1904. Following examination of each painting, I was left with 27 in oil and 4 watercolours which contained sufficient detail of reflections for further analysis. Here is a selection of six, in addition to the three which I detailed in the previous article. Marine (1864) is an early watercolour which appears likely to have been painted en plein air. 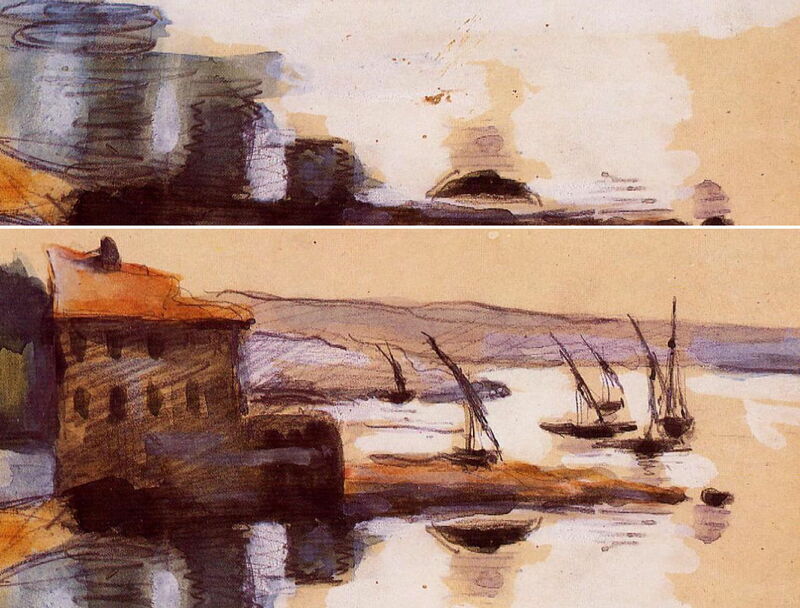 Both in the graphite drawing and the overlaid paint, the simple blocked form of the reflection of the dominant building is depicted in three dark columns of varying height, in marked contrast to its real image. This, together with the displacement, is shown in the composite view below. 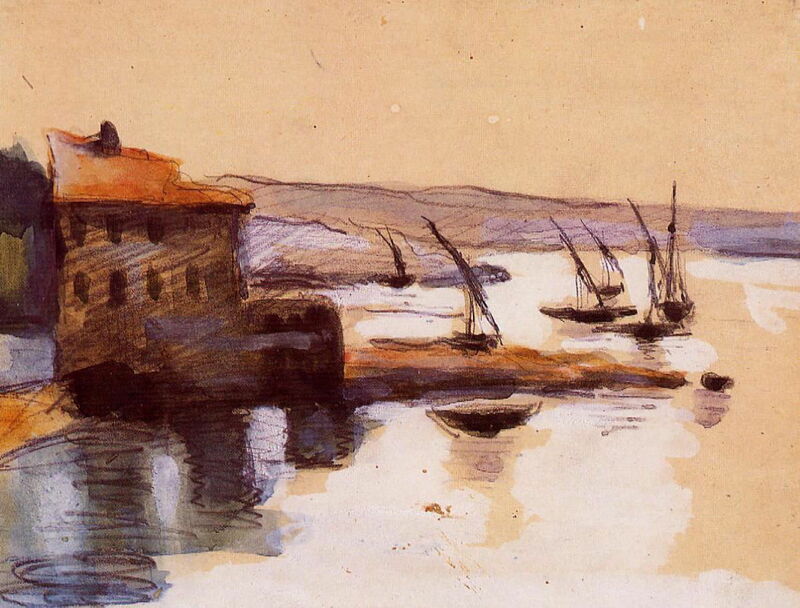 Paul Cézanne, Marine (1864) RWC004, pencil and watercolour on paper, 17 x 22.5 cm, Private collection. WikiArt. Shown in composite view to examine the reflections. Alignment of the edges of the building in the real and virtual images is not close, with displacement of the left edge reaching 8 mm. There do not appear to be any rhythmic relationships between the columns shown in the reflection and other passages in the painting, and no compositional or structural reason is apparent to account for the major disparities in the reflections. Cast shadows do not appear to have been shown. A work which has seldom been shown or reproduced, these disparities and their presence in such an early work do not appear to have attracted either recognition or comment. In contrast, La maison du Père Lacroix, Auvers-sur-Oise (1873) is far better known. 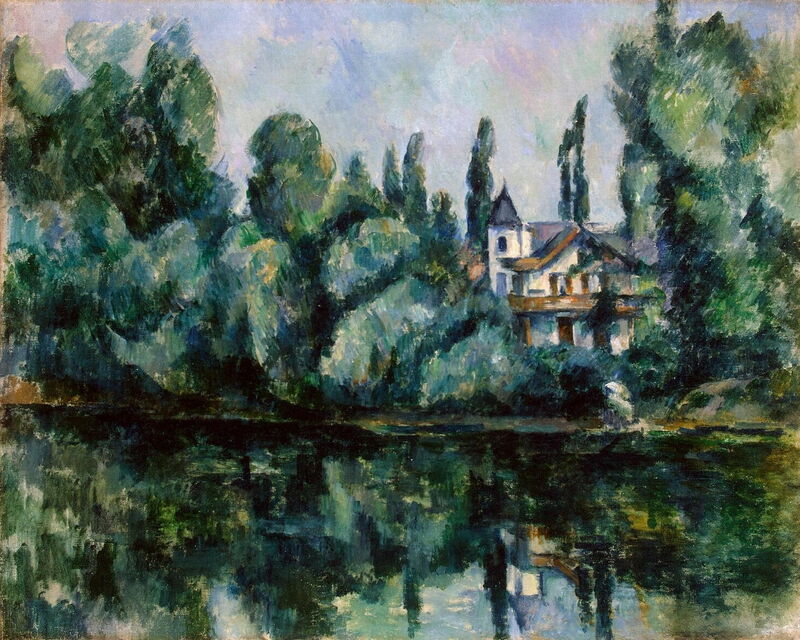 It was painted during the early part of Cézanne’s first campaign along the River Oise, and is an Impressionist rendering of a house and its garden, at the water’s edge. Although the reflections shown are limited, they extend across the whole of the bottom of the canvas. The original (real) image reads from left to right as a low bush with pale green at its top, a prominent fence paling, further palings largely overgrown by green vegetation, then from the centre low bushes with yellow flowers, ending at the extreme right in darker and less distinct low vegetation. The reflections shown are different in almost every respect, starting at the left with a dark area apparently devoid of vegetation, a blank area below the prominent paling in the real image, at least a dozen palings clear of any vegetation, yellow flowers on green which do not match the real image but which appear continuous with it, and a dark area of apparently less prominent foliage. Although some of the discrepancies in the yellow flowers could be accounted for by the difference in angle of their view between real and reflected images, those in the fence palings cannot. The real palings generally lean to the left, although those shown in the reflection lean to the right. There is an apparent displacement between the left edge of palings amounting to 17 mm, but this could be exacerbated by the absence of the leftmost paling in the reflection; the artist’s intention is unclear. Because of the extent of the discrepancies, only two measurements could be made. Several cast shadows appear on the roofs of the house, confirming a light source to the right. However the shadows suggest at least three different angles, ranging from about 30˚ to 80˚ from the horizontal. No shadows appear to be cast from any of the vegetation in the foreground. A possible explanation for this is a problem well known in plein air painting, if shadows are painted at different times, as the light changes. Unless light and shadow are ‘frozen’ at a single moment and kept to values seen at that instant, paintings show a composite of lighting effects spread across the whole period in which painting took place; however this would not account for the discrepancies in reflections, which are relatively unaffected by changing light (at least as far as the optical principles are concerned). Unusually for Cézanne, he has signed this painting, which could be read as an indication that he considered that it was finished, and it was shown at the First Impressionist Exhibition the following year. Marking the start of his impressionist phase, this work has been seen and discussed quite extensively, and these disparities noticed. Machotka (2008) wrote: “he paints the slats of the fence as if they continued into the water, parallel to the tall tree, when in fact they should be mirrored. We are not necessarily meant to notice such details, but we are meant to take in their effect, and Cézanne’s craft requires them to be right if the painting is to work as a whole.” (p. 83). Opinion has therefore held that these disparities are for artistic reasons, and intentional; however their purpose appears ill-defined. Le bassin du Jas de Bouffan (1876) is one of the best-known views of the Jas de Bouffan painted by Cézanne, showing a small outhouse, a gate, statuary, and trees reflected in the still surface of the large pool, all brilliantly lit by the Provençal sun. However cast shadows are generally absent. Overall, Cézanne’s depiction of reflections here comes quite close to those expected by optical principles (closer than in any previous painting), and the structures depicted in the painting have been verified against a more modern photograph of the motif. Lateral displacement was only found in four of ten features, the largest being of slightly less than 11 mm. However there are some smaller disparities which become clear on careful scrutiny of the reflections, and are brought out in the composite view below. Paul Cézanne, Le bassin du Jas de Bouffan (1876) R278, oil on canvas, 49 x 55 cm, Dr. Otto Krebs, Weimar, Germany, presently at The State Hermitage Museum, St. Petersburg. WikiArt. Shown in composite view. Starting at the left of the painting, the flowering bush shown in front of the small outbuilding is omitted from the reflection, although it stands clearly in front of the building. The palings of a wooden gate are also shown cursorily in the reflection, despite their detail in the original image, a pattern true of the statue of a lion in front, and to the right, of the pillars of the gate (the corner of the pool). There is then a longer passage which is more difficult to assess: the original image shows bright flowers and plants, some apparently in pots close to the water’s edge, others set further back. Whilst the corresponding reflections probably omit much of this, the originals may have been set sufficiently far back as not to appear in reflection. However a more obvious disparity is seen at the right, under the statue of a dolphin, where the reflections are aligned in accordance with optical principles, but the details shown do not match. What appears to be a low wall is either not shown in the reflection, or its reflection appears above the water level, behind and to the right of the stream of water pouring into the pool. The reflection of the pedestal on which the statue rests is not truncated as would be expected, and is depicted too far down the painting. For comparison, the top of the pedestal remains below the back of the lion statue, although its reflection terminates above that of the lion’s head and close to that of the top of the gate palings. The statue is also shown in reflection as being no broader than the pedestal, whilst the original image shows it extending to each side of the pedestal. At the far right, red flowers and a tree appear in the original, but the reflection shows blue sky. The following year (2006), he wrote: “The Jas de Bouffan basin, with its rectangular stone surround, would become a favourite subject. 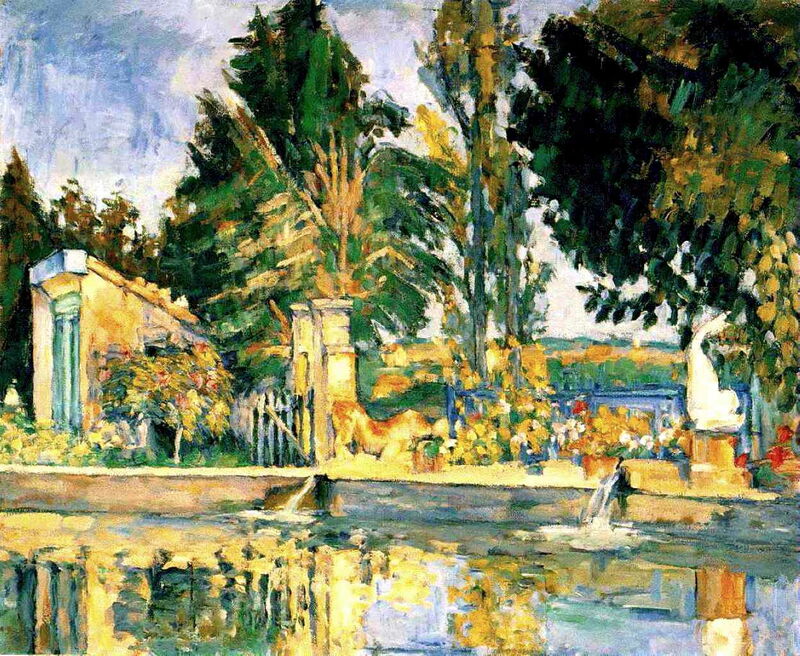 Hardly straying from the house, Cézanne made five paintings of this small pool, whose shining surface fascinated him, with its reflections of the tree and flowers. Experimenting with an impressionist approach, he attempted to capture the water’s gleam in separate blots of iridescent color, applying his pigment in light, supple, nearly transparent brush strokes. He handled the oil paint almost as if it were watercolor – the hues are clear and fluid, highlighted here and there by brilliant flashes of red or green.” (p. 85). However Arrouye (2011) felt the disparities were more marked, and compositional, writing: “Dans Le Bassin du Jas de Bouffan (vers 1876, NR 278) une partie du bassin occupe le quart de la hauteur du tableau sur toute sa largeur et reflète la partie inférieure du paysage qui s’étend au-delà; sur son bord poussent des fleurs rouges et jaunes et sont posés des pots de fleurs; or, rien de cela ne paraît dans les reflets peints. Cézanne élague, car létendue d’eau plate sert d’assise à son paysage et il souhaite organiser un contraste entre la relative vacuité de celle-là et la profusion végétale de celui-ci. Ce traitement de l’eau révèle les libertés que peut prendre le peintre par rapport à son motif pour composer un tableau à sa guise.” (p. 160). 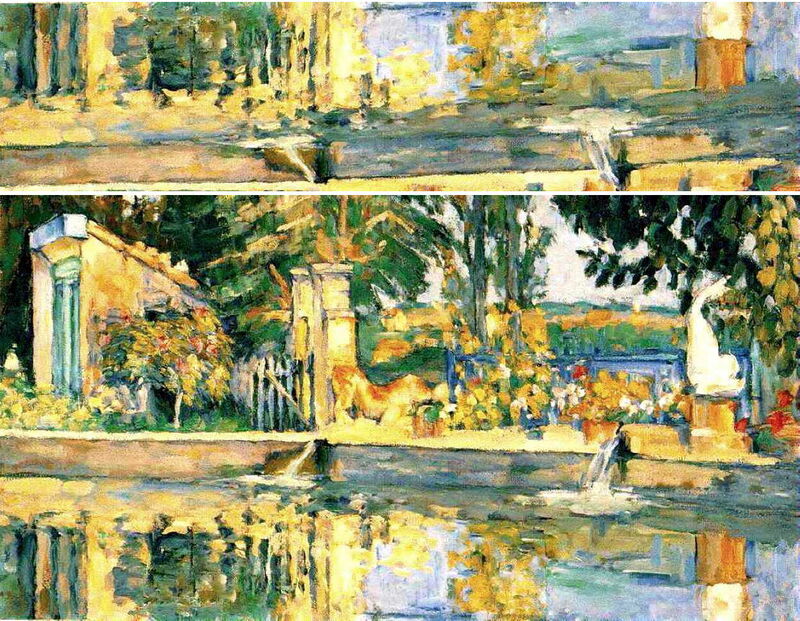 (“In Jas de Bouffan, the Pool (…) a section of the pool occupies a quarter of the picture’s height and all of its width, reflecting the lower part of the landscape that extends beyond it; red and yellow flowers grow at its edge, and flowerpots also feature – yet none of this appears in the reflections he painted. Cézanne is pruning it, as the area of still water is being used to anchor his landscape, and he wants to set up a contrast between the relative emptiness of the latter and the profusion of parts in the former. This treatment of water shows the liberties the painter could take with his subject in order to compose a painting the way he wanted.”) (p. 160). 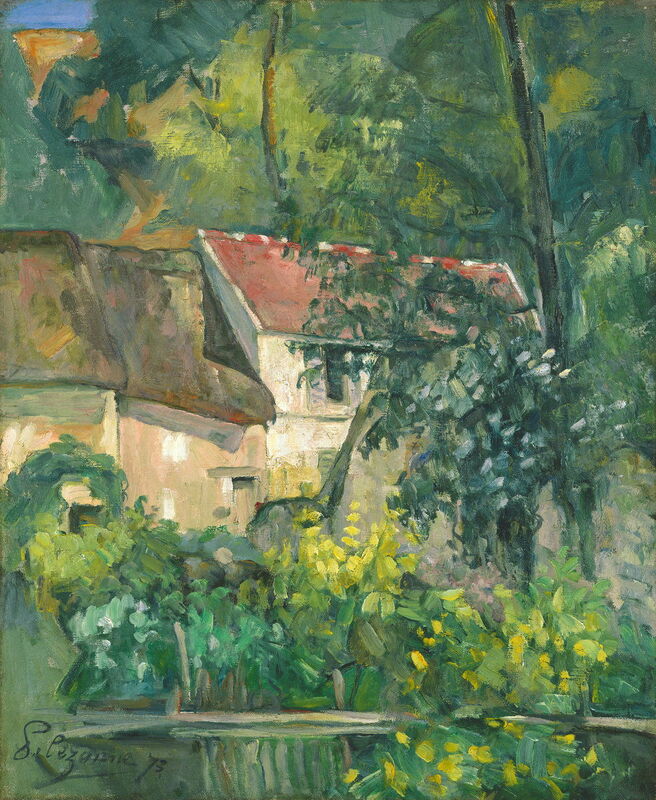 It is sometimes stated that, unlike Monet, Pissarro, and Sisley, Cézanne did not paint series, but my next choice is one of three canvases depicting an almost identical view of a house on the bank of the river Marne: undeniably a series. Of the three, I will show only the version in the Hermitage, as the other two are not accessible for reproduction here. The version in the White House, Washington, DC, has more obvious discrepancies, though. Paul Cézanne, Bords de la Marne I l’Île Machefer à Saint-Maur-des-Fossés (1888-94) R623, oil on canvas, 65 x 81 cm, Hermitage Museum, St Petersburg. Wikimedia Commons. Bords de la Marne I (1888-94) is the second in the series, and shows the motif from a slightly different angle, and closer in towards the house, compared with the version in the White House. Nine objects were assessed for lateral displacement, which appeared to be even greater than in the first of the series. Three of the displacements measured were between 20 and 23 mm, and four between 17 and 19 mm. A composite view of the detail of the house is shown below. Paul Cézanne, Bords de la Marne I l’Île Machefer à Saint-Maur-des-Fossés (detail) (1888-94) R623, oil on canvas, 65 x 81 cm, Hermitage Museum, St Petersburg. Wikimedia Commons. Shown in composite view. To the left of the midline of the painting, the structured forms of trees (which are quite similar to those in the first of the series) are not shown as such in their reflections. As those trees become lower in front of the house, there are obvious disparities in colour, tone, and structure of the reflections, such that the reflections shown in front of the house are largely black, quite unlike the original image. Four prominent individual poplars are shown against the sky in reflection. Of those, the leftmost corresponds closely to a tree in the original image, the next has been displaced right in reflection, as has the pair on the right. The reflection of the house has also been displaced visibly to the right, in its entirety. The conical spire on top of the tower starts at roughly the same level as the top of the main roof of the house, but is higher in the reflection. Much of the front of the house, shown in clear detail in the original image, is obscured by black and dark green in the reflection, and at the right of the painting white and pale brown areas are omitted from the reflection, which remains very dark. Although perhaps not quite as clear as in the first of the series, there are differences in the depth order of the trees and house. In the original image, there is a prominent poplar behind the tower, which appears at the front left of the tower in reflection. The two prominent poplars behind the original image of the main house (in line with its gable) are also shown in the reflection as being in front of the house. However lateral displacements are not quite as great as in the first painting. Surprisingly, these issues do not appear to have attracted comment in the literature. 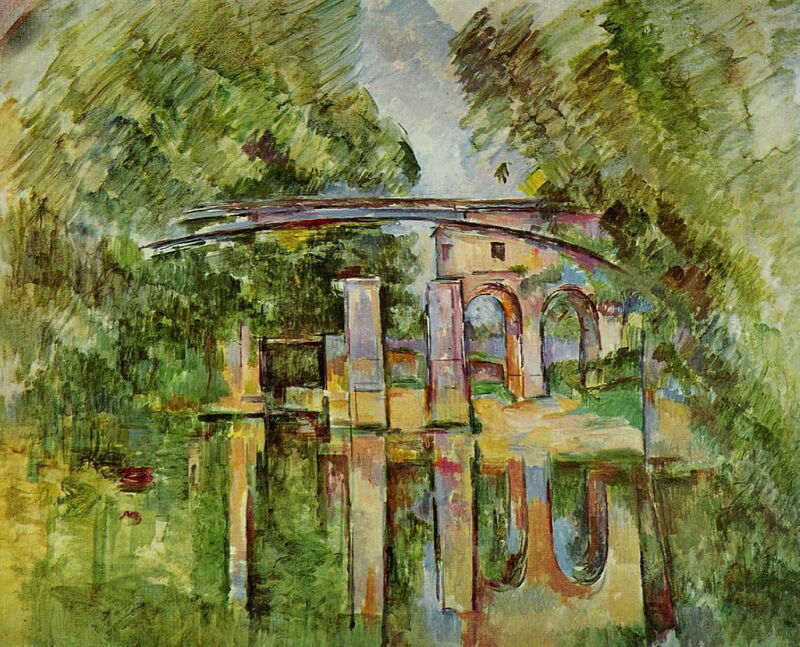 L’aqueduc et l’écluse (1894, or 1895-8) shows a view that has structural similarities to that of Cézanne’s Villa au bord de l’eau (1890), but which here appears totally different. Paul Cézanne, L’aqueduc et l’écluse or Le Moulin brûlé à Maisons-Alfort (1894, or 1895-8) R765, oil on canvas, 73 x 92 cm, Private collection. Wikimedia Commons. Most distant is a building over two arches, which reaches out from the right to the middle of the painting. To the left of it are two low buttresses with a horizontal piece bridging them. In front are two higher butresses which appear unconnected with other structures. Closest to the viewer is a bridge arching over the water, its pier at the right edge of the canvas. 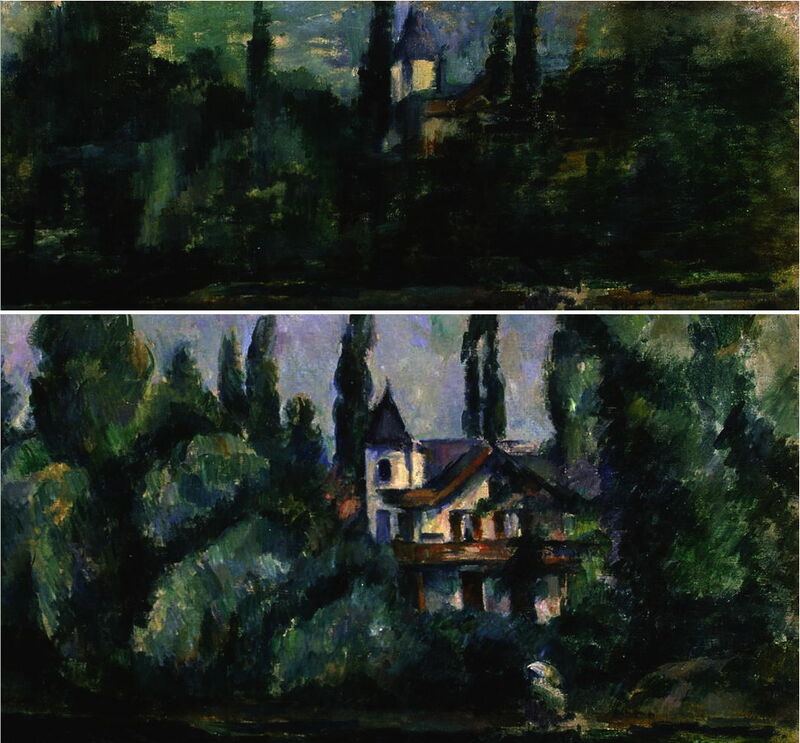 To each side of the view are high trees, rendered using rectangular patches of colour, each composed of a series of brushstrokes, here mainly laid diagonally (Cézanne’s ‘constructive stroke’). The direction of lighting is not clear, and there are no cast shadows. Ten objects were assessed for lateral displacement, of which four showed small shifts of up to 6.5 mm, but one showed a much larger shift of 27 mm. These and the various discrepancies are made clear in the composite view below. Paul Cézanne, L’aqueduc et l’écluse or Le Moulin brûlé à Maisons-Alfort (1894, or 1895-8) R765, oil on canvas, 73 x 92 cm, Private collection. Wikimedia Commons. Shown in composite view. The banks of trees at each side and the central area of sky appear to match between original and reflection. However there are several discrepancies in the structures as depicted in reflection. All the buttresses, piers, and arches are vertically exaggerated in their reflections, and most lean noticeably in the opposite direction to the originals. The leftmost buttress appears quite different in its reflection as compared with the original, its reflection being as high as the pair of isolated buttresses in front, despite its original image reaching to only about two-thirds of their height. In the reflection immediately to the right of that leftmost buttress can be seen evidence of an arch, perhaps part of pentimenti there, which does not correspond to anything in the original, except perhaps the shallow, flat bridge. 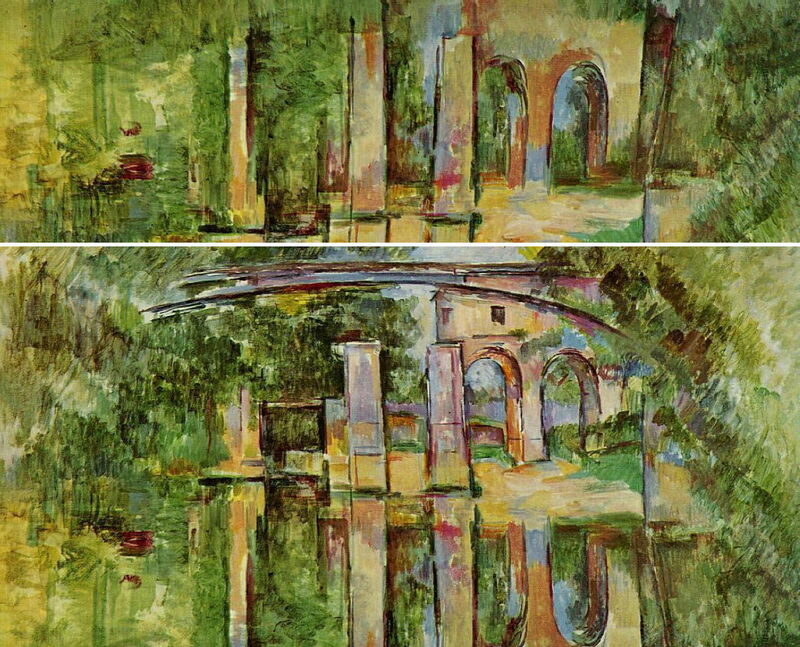 Reflections shown for the two isolated buttresses in the middle of the painting start at their foot, although this also appears to be part of the bank rather than water. Similarly reflections of the arches of the building start on the bank and not the water, and those arches are not truncated in height to allow for their distance back from the water’s edge. The arches themselves are not shown from the low view expected in a reflection: more is seen of the underside of the top of each arch in the original than in its reflection. Not only the arch of the bridge but its right pier are either not shown in the reflection at all, or appear with distorted form and colour. Thus the reflections shown capture the rhythmic structure of the piers and buttresses, but their forms are so idiosyncratic as to cast doubt as to whether they are reflections on water at all. Even if this painting is far from complete, its reflections make it one of Cézanne’s most enigmatic. Maison au bord de l’eau (1900-4) is a late watercolour showing a house surrounded by tall poplar trees, fronting onto a body of water. There are large areas of white ‘reserved’ space and relatively few reflections, but the crisp geometric depiction of the house and its reflection enable assessment of those details that are shown. It is curious that this appears to be the most geometric of all Cézanne’s paintings of reflections, and precedes his depictions of le Cabanon de Jourdan in oil and watercolour of 1906. Given the extensive claims that Cézanne eschewed the device of linear perspective and other impedimenta of academic drawing, it is puzzling that in those final years he should make three paintings which appear to contradict his earlier course of over 25 years, reverting almost to his Cour de Ferme of the early 1860s. Four objects could be assessed for lateral displacement, all of which showed some shift, although only one was large enough (at 13 mm) to be obvious. This and other disparities are made clearer in the composite view below. 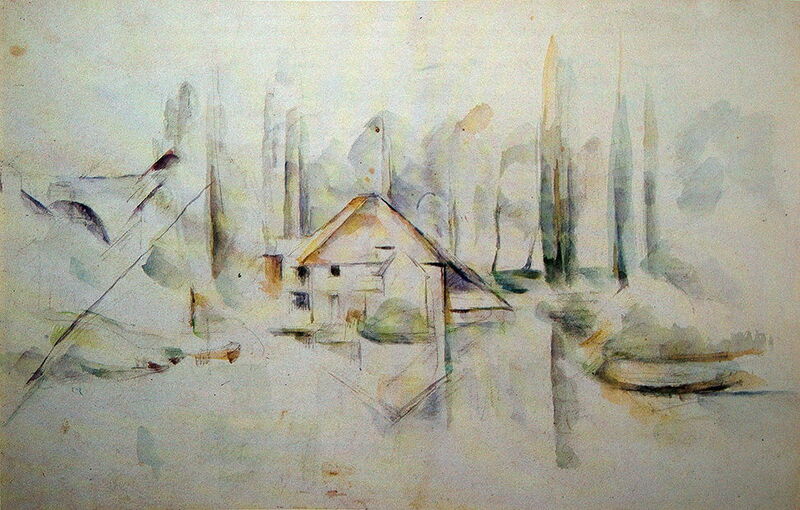 Paul Cézanne, Maison au bord de l’eau (1900-4) RWC540, watercolour and graphite on paper, 29.8 x 46.4 cm, Private collection. Wikimedia Commons. Shown in composite view. In the original image, the front of the house roof is shown to have a single broadened gable at its apex, but the reflection omits the horizontal section at that gable. As a result the left side of the reflection of the house is markedly asymmetric with the original. This is exacerbated by displacement of the apex of the reflected roof to the right, which in turn makes the reflected roof appear much less high than the original. Possibly recognising the difficulties and asymmetry which had arisen, the left side of the roof reflection is left incomplete, the pencil line indicating its position stopping level with the end of the reflection of the left side of the sloping roof, where it is clearly too close to the bank. The single poplar tree shown in reflection is also visibly displaced to the right. Given the few lines which make up the reflections shown, the mismatch with the original image is almost complete. In spite of these disparities, Rewald (1977) wrote: “The multiple reflections on the water are observed with a true painter’s relish.” (p. 412). Verdi (1990) wrote even more enthusiastically: “The design centres upon a house surrounded by tall trees and viewed across a calm stretch of water. From the horizontal, vertical, and diagonal axes of this building Cézanne derives a system of parallels which permeate the entire sheet. At the left the inclined trunk of a tree, seen before the arc of a viaduct, aligns itself with the roof-top of the house; while, to either side of this building, a rhythmic screen of trees frames it. Reflected in the water below, these elements lose none of their poise or alignment.” (p. 195). However it is hard to account for the disparities seen in this painting except as the result of drawing errors. Every one of the 31 paintings analysed contained visible, usually obvious, disparities in the reflections depicted in them, with respect to optical principles. A total of 179 features were matched across real and virtual images, of which 22% were found to have been displaced laterally in reflection by 10 mm or more, and 8% by 20 mm or more. Displacements were overwhelmingly to the right of the real image (85%). pentimenti probable in 3 – R224 (1873-4), R350 (1878), R765 (1895-8). Only 10% of the paintings analysed showed no displacements in reflected features at all. In the next article in this series, I will bring together existing claims to account for these discrepancies, and try to arrive at the most reasonable explanation. Arrouye J (2011) “L’eau, miroir de la peinture”, pp 154-161 in D Coutagne Cézanne et Paris, Rmn-Grand Palais, Paris. Translated as “Water the mirror of painting”, pp 154-161 in D Coutagne Cézanne and Paris, Rmn-Grand Palais, Paris. Coutagne D (2005) “Le Jas de Bouffan”, pp 30-49 in P Machotka P. Cézanne les Sites Provençaux, Éditions Crès, Marseille. Coutagne D (2006) “The Jas de Bouffan”, pp 76-121 in P Conisbee and D Coutagne Cézanne in Provence, Yale University Press, New Haven, CT.
Coutagne D (2011) P. Cézanne à Paris et en Île-de-France, Éditions Crès. 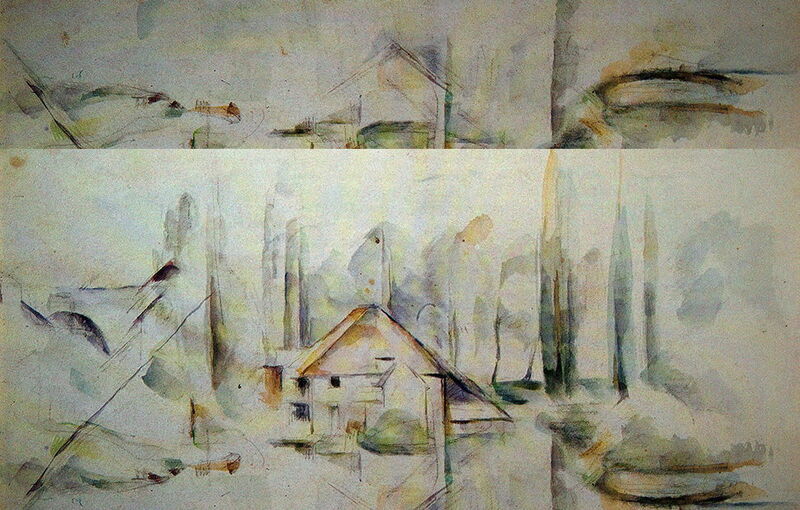 Coutagne D and Hurtu R (2011) “Paysages des années 1888-1905”, pp 134-147 in D Coutagne Cézanne et Paris, Rmn-Grand Palais, Paris. Translated as “Landscapes of the years 1888-05”, pp 134-147 in D Coutagne Cézanne and Paris, Rmn-Grand Palais, Paris. Machotka P (2008) Cézanne, the Eye and the Mind, Éditions Crès, Marseille. Rewald J (1977) “Catalog”, pp 385-415 in W Rubin Cézanne, the Late Work, The Museum of Modern Art, New York. Rewald J (1996) The Paintings of Paul Cézanne, a Catalogue Raisonné, Harry N Abrams, Inc., New York. Verdi R (1990) Cézanne and Poussin, the Classical Vision of Landscape, Lund Humphries Publishers, London.